PROC MEANS is one of the most common SAS procedure used for analyzing data. It is mainly used to calculate descriptive statistics such as mean, median, count, sum etc. It can also be used to calculate several other metrics such as percentiles, quartiles, standard deviation, variance and sample t-test. The data includes seven variables and 499 observations. It comprises of survey responses from variables Q1 through Q5 and two demographics - Age and BU (Business Unit). The survey responses lie between 1 to 6. In the DATA= option, you need to specify the dataset you want to use. 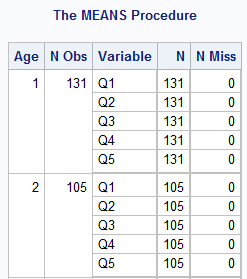 In the VAR= option, you need to refer the numeric variables you want to analyze. You cannot refer character variables in the VAR statement. By default, PROC MEANS generates N, Mean, Standard Deviation, Minimum and Maximum statistics. The most frequent statistical options used in PROC MEANS are listed below against their description. Suppose you want to see only two statistics - number of non-missing values and number of missing values. N refers to number of non-missing values and NMISS implies number of missing values. Tips : Add NOLABELS option to delete Label column in the PROC MEAN table. Suppose you want to group or classify the analysis by Age. You can use the CLASS statement to accomplish this task. It is equivalent to GROUP BY in SQL. You can use NONOBS option to delete N Obs column from the Proc Means table. First, you need to create an user defined format. Add FORMAT statement to use user defined format in PROC MEANS. The DESCENDING option to the right of the slash in the first CLASS statement instructs PROC MEANS to analyze the data in DESCENDING order of the values of Age. Instead of displaying the results in “sort order” of the values of the Classification Variable (s) you specified in the CLASS Statement, order the results by frequency order using the ORDER=FREQ option in the CLASS Statement. You can order the results by user defined format of a variable specified in the CLASS statement using the ORDER=FORMATTED option in the CLASS Statement. Note : If you specify CLASS statement without VAR statement, it classifies the analysis by all numeric variables in your data set. Make sure you sort the data before using BY statement. The CLASS statement returns analysis for a grouping (classification) variable in a single table whereas BY statement returns the analysis for a grouping variable in separate tables. Another difference is CLASS statement does not require the classification variable to be pre-sorted whereas BY statement demands sorting. You can use NOPRINT option to tell SAS not to print output in output window. In the above code, readin is a data set in which output will be stored. 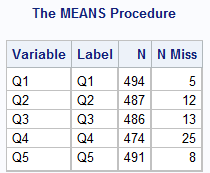 The MEAN= MEDIAN= options tells SAS to generate mean and median in the output dataset. The AUTONAME Option automatically assigns unique variable names in the Output Data Set “holding” the statistics requested in the OUTPUT statement. You can use AUTOLABEL option to automatically assigns unique label names in the Output Data Set “holding” the statistics requested in the OUTPUT statement. 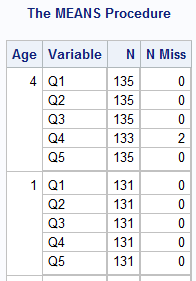 You can specify variables for which you want summary statistics to be saved in a output data set. You can give custom names to variables stored in a output data set. We can use DROP and KEEP options to remove or keep some specific variables. The WHERE statement is used to filter or subset data. In the code below, we are filtering on variable Q1 and telling SAS to keep only those observations in which value of Q1 is greater than 1. When two ore more variables are included in the CLASS statement, PROC MEANS returns 3 levels of classification which is shown in the _TYPE_ variable. Suppose we are specifying variables AGE BU in the CLASS statement. SAS first returns mean and median of variables Q1-Q5 by BU. It is the first level of classification which can be filtered by using WHERE = ( _TYPE_ = 1). The same analysis by AGE is shown against _TYPE_ = 2. 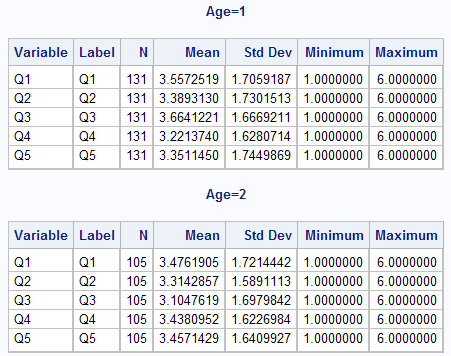 When _TYPE_ = 3, SAS returns analysis by both the variables AGE and BU. Using the NWAY option instructs PROC MEANS to output only observations with the highest value of _TYPE_ to the new data set it is creating. By default, PROC MEANS will analyze the numeric analysis variables at all possible combinations of the values of the classification variables. With the TYPES statement, only the analyses specified in it are carried out by PROC MEANS. DESCENDTYPES Option : Orders rows/observations in the output data set by descending value of _TYPE_. Multiple CLASS statement permit user control over how the levels of the classification variables are portrayed or written out to new data sets created by PROC MEANS. It means any one of the classification variable can be displayed in descending order. With PROC MEANS, we can perform hypothesis testing using sample t-test. Alternative Hypothesis - Population Mean of Q1 is not equal to 0. The PRT option returns p-value which implies lowest level of significance at which we can reject null hypothesis. Since p-value is less than 0.05, we can reject the null hypothesis and concludes that mean is significantly different from zero. PROC MEANS is used to calculate summary statistics such as mean, count etc of numeric variables. It requires at least one numeric variable whereas Proc Freq does not have such limitation. In other words, if you have only one character variable to analyse, PROC FREQ is your friend and procedure to use. 12 Responses to "SAS : Detailed Explanation of Proc Means"
I need to create categories. I have the data set in SAS. Where to I start? HI BALU HERE, MANY MANY THANKS FOR THIS PROC MEANS, PLZZZZZ EXPLAIN PROC FREQ TOO..
Did you miss description under 'Common Statistical Options' table? Hi Deepanshu, I am using SAS on demand and am trying to import the test file however am getting this error. ERROR: Physical file does not exist, /home/ravi260719910/C:\Users\Administrator\Downloads\test.xls. Could you help me with the possible reasons for this? ur listendata is very helpful sir..thank you so much..